“Oh, look at that, an alert…” What would Captain Raymond Holt of the ninety-ninth precinct say – and in only 280 characters, no less? Andre Braugher, the man, the myth, the legendary actor who graces us with his portrayal of the police captain from Brooklyn’s 99th precinct, purveyor of quick witticisms, home truths, and slogan vest tops – has joined Twitter and I am in a state of total deadpan euphoria. We can only assume Chelsea Peretti – the comic acting genius behind Gina Linetti – has something to do with this glorious news. Braugher got into character to take to Twitter for the first time with an inevitably popular tweet, which at the time of writing has amassed 20,000 ‘likes’. 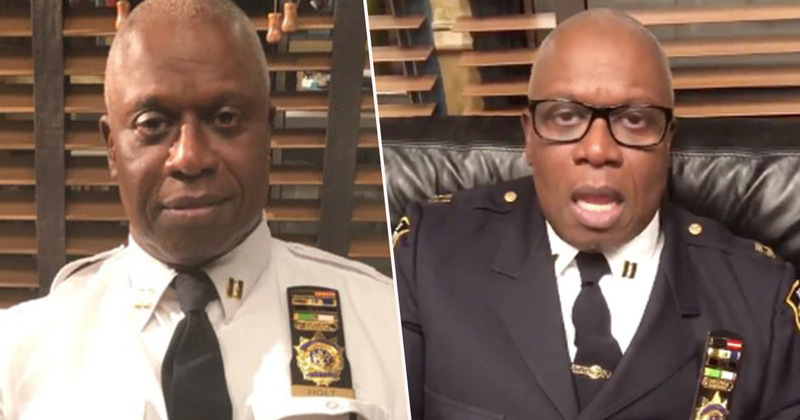 Captioned ‘Testing 123, is this thing on’, Braugher shared an accompanying video, in full Holt garb – the only thing missing was the furry pig, Cheddar. Hi, it’s me, Andre Braugher. I’m here. Simple. Effective. Classic Holt. Although we can’t help but notice the contraction of ‘it is’ and we’re worried. Andre Braugher has been bringing Captain Holt to life ever since Brooklyn Nine-Nine began, making Jake wear a tie and delivering expertly-timed rejoinders to Madeleine Wunch, who is absolutely a goat, you goat. It’s only right, then, this titan of telly acting should be able to wade in with some sassy hot takes on Twitter from now on in. In the words of Holt himself, he’s ‘probably trending already’. Fans of Brooklyn Nine-Nine – a famously loyal bunch who managed to tweet reply their way into getting a sixth series picked up by NBC after Fox (boo hiss) cancelled the show – have responded accordingly. Many fans have apologised – as Holt would – for getting so emotional. UNILAD – in a mission to help art reflect life and make the cast of the Nine-Nine seem real for a brief glorious moment – has done the necessary research to confirm this is not a bot, as fictional Twitter thought in the show’s episode when Holt joined Twitter, but is indeed ‘a human male’. Disclaimer: I’m just going off the verified tick, to be honest, but it’s enough. Instagram is a gateway drug…join me on Twitter @andrebraugher! We’ve also had the move confirmed via song on Braugher’s Instagram, ‘the gateway drug’ of social media platforms, according to the actor, who has posted a grand total of six pictures. Welcome to the murder, Dad – I mean, Captain!